This indeed is a season of open letters, the session of which you heralded with a contemptuous one to His Excellency, Dr. Goodluck Jonathan, President, Commander-in-Chief of the Armed Forces of the Federal Republic of Nigeria. Your eldest daughter and a former Senator. Dr. lyabo Obasanjo, feeling uncomfortable with your antics quickly fired a response to your now infamous letter that has gone viral and continue to generate negative national discourse. President Goodluck Jonathan GCFR, an amiable gentle man to whom you routed your vicious open letter would not tolerate Presidential aides writing nor commenting on your letter, and so ordered a stay of action. He in his characteristic manner of respect and decorum said he would personally reply. I am quite certain that the President did not want to join issues with a benefactor and former President. He would have wanted the charged atmosphere your open letter orchestrated to ride itself out until normalcy and calm return to the polity, as witnessed in other incitive comments by well placed Individuals in the recent past. However, as you well intended the echoes of your vicious letter continue to reverberate negatively. The President had no option left but to reply you through the same medium of an open letter. With a deep sense of responsibility the President touched all the damaging allegations you heaped on his administration and today Nigerians are better informed. In the light of the forgoing, it has become incumbent upon me at this point in our national life to refute some of the issues highlighted in your letter especially about the Ijaws so that Nigerians must know that you are not the saint you claim to be, but a mischief maker, an ego maniac who always wants to play to the gallery. As rightfully put by your daughter lyabo “Nigeria does not belong to Obasanjo”. In addition, I want to buttress the assertion that all Nigerians are equal no matter where they come from, that is, no one is a second class citizen of this nation. You have no right to plunge Nigerians into crisis as your past actions and recent open letter to the President connotes. The generality of Nigerians think your letter is treasonable. Ordinarily, I never intended to join in the affray of accusations and counter accusations between a former President and a sitting President and a daughter in between. But, Chief Olusegun Obasanjo in your usual characteristic hatred and use of sarcastic remarks about Ijaw, you have again berated and insulted us the Ijaws in your letter to Mr. President. Dr. Goodluck Jonathan has never for once acted nor behaved as an Ijaw man since he took office as President, and we hold no grudge against him for that. Secondly, as a Nigerian and an Ijaw man, I am proud to belong to both entities. Unlike you Obasanjo who is a Yoruba man first before being a Nigerian, I Chief E.K. Clark am the accepted leader of the Ijaws, while unfortunately you, Chief Olusegun Obasanjo, are not accepted as leader of the Yorubas despite being Head of State twice, because you lack the virtues and honour deserving of a Yoruba leader. Your devilish and inciting remarks about the Ijaws are unfounded. I am indeed very sad and disturbed that you can make such a malicious, mischievous statement about an ethnic group which you did pejoratively knowing fully well that it has no single iota of truth nor foundation purposely to instigate and incite the rest of Nigerians against Mr. President and Ijaw come 2015.
i) The NSA in-charge of security in the whole country is Fuiani from Sokoto state. xxv) The Director-General of NAFDAC is from Benue. NDDC Chairman is Ibibio from Akwa Ibom State Director-General National Orientation Agency is from Nasarawa State The Economic Adviser to the President is Ibo. The Chief of Protocol to Mr. President is a Yoruba man. The Ambassador of Nigeria to United States is Yoruba. The Nigerian Permanent Representative to United Nations is Ibo. The Nigerian High Commissioner to United Kingdom is Hausa/Fulani. Nigeria Ambassador to Russia Akwa Ibom. Nigeria Ambassador to China is Hausa. Nigeria Ambassador to Argentina, Benue. Nigeria Ambassador to France – Yoruba. Nigeria Ambassador to Spain – Ibo. Out of the 64 ambassadorial posting to various Nigerian missions abroad, only three are Ijaw. No Ijaw person is Vice-Chancellor of any of the 36 Federal Universities. The President has 18 Advisers approved by the Senate, only Mr, Oronto Douglas is Ijaw. The number of Ijaws in the Federal Civil Service under Jonathan’s Administration has not increased and the number of Permanent Secretaries is only three Ijaws out of about seventy. There are only two Ijaw Ministers out of 42. Only one Ijaw man from Rivers State owns Oil bloc even though most of the oil comes from Ijaw land. No Ijaw man is an oil marketer and no Ijaw man lifts oil. You have agreed that the amnesty programme has not been implemented properly. The second phase which is infrastructure development is yet to take place. The 45-Man Technical Committee recommendations White Paper under the Chairmanship of Comrade Ledum Mittee is yet to be released. This is one of the few areas Ijaw people could have benefited. Where are the Ijaws who have taken possession of President Jonathan? 1. Hausa language was the lingua franca at the Presidency while Alhaji Shehu Shagari was the President of Nigeria from 1979-1983. 2. Hausa language continued to be lingua franca in the Presidency when the military was in power between1983-1998. 3. Between 1999-2007, the Yoruba language became the lingua franca during your Presidency. 4. Between 2007-2010 the Hausa language returned to the Villa as lingua franca during late Umaru Musa Yar’dua administration and in fact, he was accused of bringing nearly all members of the State Executive to the Federal government. Is the Ijaw language the lingua franca at the Presidency now? The answer is NO. My Dear Chief Olusegun Obasanjo, you have become an unrepentant trouble maker, as Nigeria gave you more than you truly deserve. Hence you see yourself as lord of the manor. You have without recourse in the past embarrassed all past Heads of State and Presidents in Nigeria through open letters and unsavory comments. In such letters, you have always alleged maladministration, corruption and incompetence against them. Nigerians are aware that you set the stage for the emergence of Goodluck Jonathan as President of the Federal Republic. But the saying goes that if you present a gift of a goat to a friend you must let go of the tether. You are probably different. Right from the inception of the Jonathan presidency, your body language indicated you wanted to play the role of the piper, that is, dictate how Jonathan runs, the phenomenon you did not tolerate from those who put you in office in 1999. An incident that played itself out then will suffice. You masterminded the removal of Chief Tony Anenih then PDP Chairman, Board of Trustee, and appointed yourself thinking the position will give you powers to control and manipulate the President. The futility of your actions dawned on you when you realized Jonathan is his own man. And in frustration you resigned as PDP Board of Trustee Chairman. You had thought the President will kneel before you begging that you stay on; but he never did. Every Nigerian therefore, knows that you connived, with PDP renegades and opposition parties to ridicule and undo President Jonathan and the government because he refused to be your puppet. In the cabinet of General Yakubu Gowon, you always pretended to be the most loyal and honest man. I was in London with General Murtala Muhammed when the coup of 1975 took place. Murtala came back to Nigeria through a KLM flight to Kano, On that fateful day you were at the Kano Airport to receive General Muhammed, and that was how that government was formed and you were part of it. Later, I met you at Dodan Barracks and asked you why you betrayed General Gowon by .going to Kano to receive Muhammed. You explained to me that you were in Kano for sporting activities, which I disagreed with. You went all out to frustrate and humiliate your Vice President, Atiku Abubakar, when he declared his intention to contest the 2003 and 2007 Presidential elections. You associated him with US Congressman William Jefferson, prompting the FBI to investigate and search his residence in Maryland. The FBI could not find any connection between Atiku and Mr. Jefferson. You were determined to stop your deputy at all cost from contesting the presidential election. A letter from Jefferson to you was handed over to the EFCC to enable it investigate Atiku, to declare him unqualified for the 2007 election. The EFCC report led to the establishment of an administrative Inquiry headed by the Minister of Justice and your boys and girls in the Cabinet. They hastily found Atiku guilty as charged by you. You sent the report to the National Assembly. You declared Atiku a persona-non-grata, his aides and vehicles were taken from him, and you declared his seat vacant. All these you did as if the constitution of the Federal Republic of Nigeria does not exist. You can see how petty you are. You did all these just because you felt Atiku worked against your third term presidential ambition. My dear Obasanjo, your allegation that President Jonathan is training snipers in preparation for 2015, is a diabolical concoction and a figment of your imagination. As you have no shred of evidence to authenticate this bogus lie. The same is applicable to the supposed 1000 political leaders being on the watch list of the President, Time and time again President Jonathan has said his election is not worth shedding a single Nigerian blood for, which is very much unlike you who played “do or die politics”. You made up these stories to whip up ethnic sentiments not only against Mr. President, but the Ijaws and the entire South South geopolitical zone. On the security issues stated in your letter I have already stated that the President should leave this serious allegation for the Security agents to investigate for no one is above the law of this country. As I also mentioned in my letter to you, I stated that the contents of your letter is a revisit to your own activities in your eight years rule between 1999 and 2007. The President in his reply referred to the attack of Bayelsa State Government House and the bombing of his personal house in Otuoke, Yenagoa, all in the attempt to assassinate him and cause chaos in Nigeria. He also mentioned the Petrol tanker incident. You were the sitting President in Nigeria at the time, you did not investigate the matter nor comment on it. I am fully aware of the incident because our late President Alhaji Umaru Musa Yar ‘Adua who was very much embarrassed and seriously shaken by it, discussed the matter with me and he appreciated the role I later played in the matter. That was the beginning of Yar’Adua’s loss of confidence in you. I am fully aware that the late President Umaru Musa Yar’Adua was ready to stop you from meddling and parading yourself with this holier than thou attitude. You were eternally lucky that the late President did not carry out his intention before he fell ill and later passed on. Your two eldest children, Senator lyabo and Gbenga have publicly denounced you and have sworn not to ever speak nor have any communication with you again until “thy kingdom come” because of the wrongs you did to them. OBJ what manner of a man are you to deserve this? You cannot carry on like a bull in a China Shop. I advise you take some time off to reflect on some of these things. On a personal note, both of us are regarded as President Jonathan’s father, in fact, according to you after God and his parent you come next before me and others. You and some of your children are always at the Villa for one thing or the other while my children do not know where the Presidency or Villa is. The only position you have not occupied is to rule the Presidency from your Ota farm in Ogun State. In his book “Accidental Public Servant”, El-Rufai stated that you informed your kitchen cabinet or economic committee that they should not disband because you would be ruling Aso Rock from Ota and you needed them. President Jonathan has not identified himself to the nation as an Ijaw man. He hardly attends their social ceremonies. But he attends social gatherings when invited by other Nigerians from all over the country. I can confirm that apart from Yenagoa and Otuoke his village, in Bayelsa State, President Jonathan has not visited any Ijaw village or town for official function or social outing. He is the most deetribalized President of Nigeria and in most case keeps away from his own people for fear of accusation by you and your cohorts. We have prominent Ijaw politicians both men and women who participated fully in the 2011 election and today they have not been able to enter the Presidency or received any patronage from the Jonathan’s government. Our people believe this is the sacrifice they have to make. And they are indeed very grateful and appreciative of the roles being played by other Nigerians of all ethnic and religious divides to make their son President. As the Ijaw leader, I have gone out of my way to remind Mr. President publicly that Nigerians expected much from him hence they voted for him overwhelmingly in 2011 and will vote for him again 2015 if he performs. I have therefore not for once advocated for fire and brimstone or that blood will flow if Jonathan is not elected in 2015. I have gone further to apologize to all Nigerians that if at any time I made a statement that threatened the unity and stability of Nigeria, I should be forgiven. Governor Sule Lamido of Jigawa State himself commended my statement. It must be recalled that some of the ex-militant leaders like Asari Dokubo, Ateke Tom Boyloaf, etc. have openly attacked Mr. President to the delight and applause of the President’s political opponents. It is therefore very unfair of you to envelope all Ijaws in your attack of President Jonathan and his people. At this juncture, I would like to challenge you to name other Ijaw persons or groups that throw insults on other Nigerians on account of Jonathan. One may therefore wish to ask you to refresh your memory when you recruited Femi Fani Kayode to attack your political opponents including your own ethnic group and you compensated him with a ministerial appointment and kept him until your last breakfast with your other kitchen cabinet members in the Villa. Is it therefore fair to accept Fani Kayode’s recalcitrant and irresponsible statements on other Nigerians, as acting on behalf of an ethnic nationality? It will be madness of anyone to do so as you have done with Ijaws because of Asari Dokubo’s statements which did not receive the applause of the generality of Ijaws. My people started voting for other Nigerians even though they had no candidates, since 1951. And they formed alliances with other people or political parties in other parts of Nigeria. For instance, in 1959 both late Dappa Biriye and Chief Melford Okilo stood election on the platform of Niger Delta Congress (NDC). Chief Melford Okilo won his election to the Federal House of Assembly. Mr. former President, 1 will also like to use the language of your daughter, lyabo to describe you to Nigerians. You are “a liar, manipulator, two faced hypocrite” and that “you have an egoistic craving for power and live a life where only men of low self esteem thrive”. You know over the years, I have always criticized you about your performance starting with the Ibori’s ex-convict case even though he may not have a good case. In the case of Alamieyesiegha you tried to use his deputy, Dr. Goodluck Jonathan, against him but he refused. You went on to use the Chairman of the EFCC to intimidate members of the Bayelsa House of Assembly and they carried out a kangaroo impeachment to remove him from office. You then immediately directed the security agencies after the impeachment to handcuff the governor and took him to Abuja for prosecution. I also criticized you when you asked your security men to arrest the candidate who was standing against your daughter in the senatorial election in Ogun State even though there was no case against him in Nigeria. You had a hand in almost every appointment in the South West hence the party collapsed in the South West. You are today one of the richest men in Nigeria if not in Africa. In 1999, it was widely reported in the media that you came out of Gashua Prison very broke. As a matter of fact, it was stated you had N20,000 in your bank account as declared in your Code of Conduct Bureau Form. In just 8 years, as President of Nigeria, you metamorphosed from a struggling ex-head of state, into a life of opulence. You must tell Nigerians the magic behind the sudden affluence. When corruption is mentioned, informed Nigerians know those that foisted the malady on our nation. The Halliburton bribe scandal and the Siemens case were lightly touched by President Jonathan in his open reply to you. These two high profile corruption cases happened during your tenure as President. How dare you point accusing fingers at others when you have a cupboard filled with skeletons? You have forgotten the saying that “a man who lives in a glass house should not throw stones”. The anti-corruption apparatus became a coercive instrument in your hands to browbeat perceived political enemies. Your vendetta against political opponents and those you believed were working counter to your third term ambition knew no limits. Chief Obasanjo your former Minister of Defence, General T,Y, Danjuma, was the first to call you a pauper, when he fell out with you. He tagged you “Stone broke”, a phrase he used to describe your pathetic financial predicament before you came to power. My dear former President, what do you really want from President Jonathan? Most of the various issues you raised in your letter are mere re-visitation of the many things you did and failed to do in your 8 years of mis-governance. In conclusion, I would like to borrow the words of Peter Howard, “the petty plans and plots of small minded men rob every nation of their destiny”. This is my new year message and response to your open letter and other subterranean activities designed to destabilize Nigeria because of your personal interest. My best wishes of the season to you and your esteemed family. Since the 18-page "open letter" which former President Olusegun Obasanjo wrote to President Goodluck Jonathan was released to the public domain, there has been disquiet in the land. Statements have been issued for and against, commentaries and even editorials have been written. In many articles and columns the belligerent contents of the letter have been viewed and reviewed from different angles. Some commentators have opted to beam their searchlight on the writer of the controversial letter, Obasanjo, an elder statesman that is not averse to stirring the hornet's nest. Reading through Obasanjo's letter, there is no doubt that he raises salient issues that are of fundamental interest to all Nigerians. But, they are mostly trite or mired in political diatribes. In a nutshell, Obasanjo's angst is founded on his aversion to the idea of Jonathan seeking re-election for a second term in office, his fury over the handling of the crisis in the ruling People's Democratic Party (PDP) to which he belongs, his disgust with Jonathan for overriding his (Obasanjo's) political leadership and influence culminating in the imposition of a particular person as PDP zonal leader for the South West zone, and what he perceives as Jonathan's incompetence in various respects including his condonation of ethnic irredentism and criminality. The rest of Obasanjo's letter consist of a bundle of contradictions: allegations, lamentations, and admonitions plus veiled chest-beating and bizarre confession of his role in past electoral manipulations and such other outbursts that a wizened old fox would haul from a safe distance at a younger and more virile one that has outfoxed him in the jungle. Shorn of political jingoism and patriotic pomposity, the only thing that can be deduced from Obasanjo's bellicose letter is that he has an axe to grind with President Jonathan. It is clear from this extremely venomous letter that the primary objective of the writer is to torpedo the perceived ambition of Jonathan to run for a second term as President. But, by the singular action of demanding that Jonathan should perish the thought of a possible re-election bid, Obasanjo contradicts himself and shows quite clearly that he is not a democrat. If he was, he would realize that in a democracy, it is only the people that can renew or refuse to renew anyone's mandate and they can only do so through the ballot box. If at this stage in the democratic evolution of our country the renewal of the political mandate of an elected public office holder is not determined by the people but by the whims and caprices of one man, then our democracy is in danger and our future is in jeopardy. Obasanjo argued that Jonathan's reelection bid would constitute a breach of some promise the president is alleged to have made before the 2011 election to the effect that he would serve for only one term. Unless Obasanjo is living in denial, he cannot pretend to be unaware that Nigeria's recent political history is replete with politicians that reneged on their pre-election promises and on top of the list is Obasanjo himself! Was it not Obasanjo who was said to have promised to serve for one term to pave the way for the return of Ibrahim Babangida, the architect of his prison-to-state house odyssey but after he won the election, he began to sing a different tune? Was it not this alleged promise that former Vice President Atiku Abubakar sought to force Obasanjo to keep in 2003 that set him on a collision course with the vengeful Balogun of Owu whose ire is like a whirlwind? Atiku touched the tiger's tail again when he instigated opposition to Obasanjo's "Third Term Agenda" in 2007 and came out of the ensuing battle badly bruised with his political ambition in stitches. Concerning the allegation of "dividing" and "destroying" PDP, Nigerians know better. Was it Jonathan that foisted a military command structure and farmed out political territories to political war lords which put democracy in retrogression in Nigeria? Was it Jonathan that promoted the emergence of "parallel structures", factions and unending divisions that have arrested the development of the PDP and prevented it's natural development? Even a political novice knows that it is the absence of internal democracy and the institution of the undemocratic culture of imposition and anointment of unpopular candidates both at congresses and party primaries by Obasanjo that is at the root of much of the unending crisis in PDP. If Jonathan has adopted this undemocratic template, then he is merely reading from Obasanjo's script. Is it not the same Obasanjo that is now chanting the mantra of "politics is a game of numbers" in his letter that initiated the massive deregistration of political opponents from which the party is yet to recover. During Obasanjo's eight-year administration, interference with the party and with the electoral process, harassment and persecution of perceived political opponents, unending removal and replacement of Senate Presidents and PDP National chairmen were common place. Was it not Obasanjo, as President, that announced to Nigerians that politics, for him, is a "do or die" affair? Controversial impeachment of governors and declarations of state of emergency, high profile murders, abduction of a sitting governor and setting of the state capital on fire, sale of federal government assets, misuse of government institutions such as EFCC, INEC, and ICPC, etc, were the order of the day. What about the scandalous land allocations, international bribery scandals involving multi-national companies, innumerable corruption cases, human rights violations, flouting of court rulings, controversial projects such as Obasanjo Presidential Library, Abuja Stadium, Transcorp shares, etc. It is commonsensical that anyone that lives in a glass house should not throw stones. Obasanjo is the least qualified person to censure or admonish anyone or to pontificate on corruption and malfeasance as he sanctimoniously did in his letter not being without stain in that regard himself. If Obasanjo is looking for a scapegoat on whom to hang the leadership failures that have brought Nigeria to the edge of the precipice, he should look in the mirror. The truth is that we, Nigerians, have all failed: self-serving leaders, tepid civil society groups, dispassionate students, wealth-amassing clergy, pinging and face-booking youths, internet-tiger diasporan community and an annoyingly docile populace. We have all failed. We can launch tirades against our leaders from the safe confines of our comfort zones, we can talk the talk, but no one is prepared to walk the walk to freedom and justice. If Obasanjo wants to develop letter writing as a hobby, he should learn to do it properly. A letter, any letter, should follow certain rules anchored on decency and decorum. If Obasanjo wants to put on the toga of an advocate of the masses, then he should abide by the rules of engagement which place objectivity and civility in front so that younger generations do not mistake absurdity for propriety. Any one that goes to the court of public opinion is like one that goes to equity: he must do so with clean hands. It is sheer hypocrisy and double standards for anyone to play the advocate in a matter in which they are as guilty as the accused. If Jonathan were to adopt Obasanjo's adversarial style, heat rather than light would be generated. And such heat could lead to a conflagration the end of which no one can predict. Thankfully, unlike Obasanjo's daughter, Iyabo, that chose to add to the fray by writing to her father in the horrid lingo that he and his protégée, Femi Fani Kayode are best at, President Jonathan in his reply to Obasanjo, aside from addressing the issues raised in Obasanjo's corrosive letter, adhered to the fine art of writing with decorum which ought to provide Obasanjo with a civilized specimen for his future letters. A statesman should exhibit civility in his manners and language. What Obasanjo has done by placing the integrity of the office and person of the President of the Federal Republic of Nigeria on the global chopping block is a bad precedent. The job of president of any country is tough enough without a predecessor having to vilify the occupant by writing letters capable of corroding the confidence of the investment community, inciting the people and destabilizing the nation. If anyone had dared to write such a letter to Obasanjo while he was president, it would have been akin to waving a red flag before an enraged bull. Even if everyone criticizes or condemns Jonathan, Obasanjo by reason of his age and experience should be the last person to join in the needless Jonathan-bashing that seems to have become a national pastime among many Nigerians citizens at home and in Diaspora. There is no other country in the world where citizens take their leader to the cleaners as we do in Nigeria. And it is very rare to find any country where a former president libels and defames his successor in the reckless manner Obasanjo has done especially when they belong to the same political party! If a retired general, a former military head of state, a former civilian President and an elder statesman of Obasanjo's standing says that the president of his country is dishonest, incompetent, and untrustworthy, how can any reasonable person except adventurers and pirates do business with that country or it's citizens? Obasanjo's letter to Jonathan is not only an embarrassment to the nation, it is a costly gambit that has wrought incalculable economic damage to the image of the country, the costly investment drive, the tourism promotion campaign, the integrity of the presidency, and the perception of every Nigerian in the eyes of world. Not even Jonathan's courteous and timely reply can remedy that in the long run. So much vitriol and virulence drip from every page of Obasanjo's letter that no discerning person can be persuaded that he wrote out of patriotism or any altruistic consideration. His letter was crafted to obliterate the credibility of Jonathan and his administration and to, thereby, deliver a mortal blow strong enough to sink Jonathan's inchoate presidential reelection ship. Period! Even the postscript of Obasanjo's letter in which he craved the indulgence of Jonathan to "share the contents of this letter" with some named persons and to extend the sharing to the world at large suggests an uncharitable intent and am attempt to obfuscate his true intension. The English writer, Francis Bacon (1561-1626) may have had the likes of Obasanjo in mind when he wrote in Essays "Of Cunning": "I know one that when he wrote a letter he would put that which was most material in the postscript, as if it had been a bymatter". In 1998, Obasanjo published a book titled "This Animal Called Man" anchored on the premise that man is a contradiction. Obasanjo's letter to Jonathan dated December 2, 2013 serves as a good example of just how contradictory this animal called man can really be. I rest my case. “Since the publication of the letter written by the President, Commander-in-Chief of the Armed Forces of the Federal Republic of Nigeria, Dr. Goodluck Ebele Jonathan, GCFR, which was in response to the letter earlier written by revered former President, Commander-in-Chief of the Armed Forces of the Federal Republic of Nigeria, Chief Olusegun Obasanjo, GCFR; we have received several requests from local and international media asking to know Chief Obasanjo’s reaction to Mr. President’s response. One, Chief Olusegun Obasanjo, GCFR, acknowledges Mr. President’s letter/response. However, Baba, as he already indicated in his December 2, 2013 letter, does not wish to make further comments beyond the contents of his last letter to Mr. President or react to the said letter/response from Dr. Goodluck Ebele Jonathan. More uncharitable persons may even see a touch of sanctimoniousness in your new belief in the carrot and stick approach to overcoming militancy and insurgency. You have always referred to how you hit Odi in BayelsaState to curb militancy in the Niger Delta. If the invasion of Odi by the Army was the stick, I did not see the corresponding carrot. I was the Deputy Governor of BayelsaState then, and as I have always told you, the invasion of Odi did not solve any militancy problem but, to some extent, escalated it. If it had solved it, late President Yar’Adua would not have had to come up with the amnesty program. And while some elements of the problem may still be there, in general, the situation is reasonably better. The allegation of training snipers to assassinate political opponents is particularly incomprehensible to me. Since I started my political career as a Deputy Governor, I have never been associated with any form of political violence. I have been a President for over three years now, with a lot of challenges and opposition mainly from the high and mighty. There have certainly been cases of political assassination since the advent of our FourthRepublic, but as you well know, none of them occurred under my leadership. That corruption is an issue in Nigeria is indisputable. It has been with us for many years. You will recall that your kinsman, the renowned afro-beat maestro, Fela Anikulapo-Kuti famously sang about it during your first stint as Head of State. Sonny Okosun also sang about corruption. And as you may recall, a number of Army Generals were to be retired because of corruption before the Dimka coup. Also, the late General Murtala Mohammed himself wanted to retire some top people in his cabinet on corruption-related issues before he was assassinated. Even in this FourthRepublic, the Siemens and Halliburton scandals are well known. Baba, I am amazed that with all the knowledge garnered from your many years at the highest level of governance in our country, you could still believe the spurious allegation contained in a letter written to me by the Governor of the Central Bank of Nigeria (CBN), and surreptitiously obtained by you, alleging that USD49.8 billion, a sum equal to our entire national budget for two years, is “unaccounted for” by the NNPC. Since, as President, you also served for many years as Minister of Petroleum Resources, you very well know the workings of the corporation. It is therefore intriguing that you have made such an assertion. You made a lot of insinuations about oil theft, shady dealings at the NNPC and the NNPC not remitting the full proceeds of oil sales to the CBN. Now that the main source of the allegations which you rehashed has publicly stated that he was “misconstrued”, perhaps you will find it in your heart to apologize for misleading unwary Nigerians and impugning the integrity of my administration on that score. The charge that I was involved in anti-party activities in governorship elections in Edo, Ondo, Lagos, and AnambraStates is also very unfortunate. I relate with all Governors irrespective of political party affiliation but I have not worked against the interest of the PDP. What I have not done is to influence the electoral process to favour our Party. You were definitely never so inclined, since you openly boasted in your letter of how you supported Alhaji Shehu Shagari against Chief Obafemi Awolowo, Chief Nnamdi Azikiwe and others in the 1979 presidential elections while serving as a military Head of State. You and I clearly differ in this regard, because as the President of Nigeria, I believe it is my duty and responsibility to create a level playing field for all parties and all candidates. Recalling how the PDP lost in states where we were very strong in 2003 and 2007 such as Edo, Ondo, Imo, Bauchi, Anambra, and Borno, longstanding members of our great party with good memory will also consider the charge of anti-party activities you made against me as misdirected and hugely hypocritical. It certainly was not Goodluck Jonathan’s “personal ambition or selfish interest” that caused the PDP to lose the governorship of OgunState and all its senatorial seats in the last general elections. This did not happen by chance. My Administration worked hard for it and we continue to maintain the best possible relations with all centres of global political and economic power. I find it hard therefore, to believe your assertions of untoward concern in the international community over the state of governance in Nigeria. Let me assure you and all Nigerians that I do not engage in negative political actions and will never, as President, oppress the people of a State or deprive them of much needed public services as a result of political disagreement. One of Nigeria's foremost nationalists – as well as one of its most divisive personalities – former President Olusegun Obasanjo has indicated interest to finally retire from active politics. He told Peoples Democratic Party (PDP) chieftains from Lagos State who visited him at his Ota home last weekend that he had had "enough" and would leave the political scene for the younger generation. Should Obasanjo go ahead with the retirement plan, he is expected to give up his position as the chairman of the Board of Trustees (BoT) of the PDP which he has held since the end of his tenure as President in 2007. Obasanjo, who last weekend met with a delegation led by elder statesman Rafiu Jafojo, Mr. William Oganga, and Princess Gloria Adebajo-Frazier, said the only developoment delaying his retirement is the need to have a new Deputy National Chairman of the PDP whose position has been zoned to the South-west. "Baba made it clear that as soon as a new Deputy National Chairman of the party emerges from the South-west, he will hand over party affairs to the person and concentrate on his ambassadorial assignments on the African continent. "He also said his priority now is to ensure that someone from Ogun, Ondo or Ekiti emerges to fill the position. He told the delegation that all the past leaders who have held the position are from Oyo, Osun and Lagos States, so to ensure fairness, he wants someone from one of the states that has not produced the Deputy National Chairman to do so", a source at the meeting told THISDAY. The role Obasanjo played in the re-zoning of the position of speaker of the House of Representatives to the South-west as well as the endorsement of Hon. Ajibola Muraina for the job is believed to be fuelling rebellion within the PDP as North-west lawmakers have vowed to truncate zoning. Besides, it is believed that Obasanjo deliberately picked the terminally ill Alhaji Umaru Musa Yar’Adua as his successor on 2007 so that power could return to the South in a short span. Of the seven former Nigerian leaders alive, only Obasanjo and Muhammadu Buhari have remained in active politics, with both men serving as BoT chairmen of their respective parties. Buhari contested last month's presidential election on the platform of the Congress for Progressive Change (CPC) which he lost to PDP's Goodluck Jonathan. Obasanjo's continued activities in the political scene have divided opinion in the country, with some urging him to pick up a role of an elder statesman in the category of former leaders such as Shehu Shagari and Abdulsalami Abubakar. 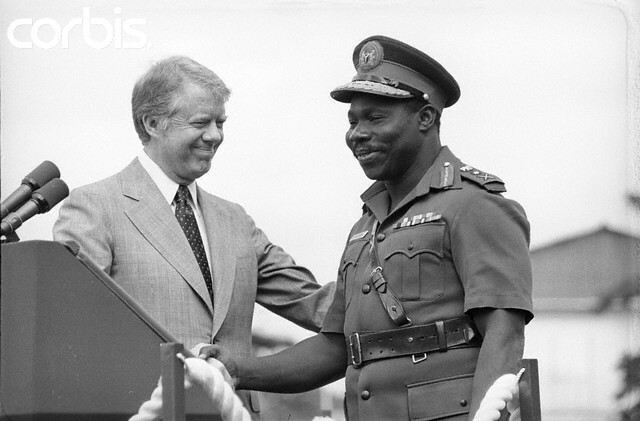 Considered one of the luckiest Nigerians around, Obasanjo rose to national prominence in 1970 when he accepted the instruments of surrender from the Biafran army which attempted to divide the country. He served as a federal commissioner of works (now minister) in the Yakubu Gowon regime and rose to the position of Head of State following the assassination of General Murtala Ramat Muhammed in 1976. He entered the history books when he handed over power to a democratically elected government in October 1979. In 1999, following his release from prison by General Abdulsalami from incarceration by the Sani Abacha regime over his alleged involvement in a coup, he was elected the President under the PDP where he served for two terms. Despite introducing far-reaching reforms while in office, he is best remembered for his failed attempt to change the constitution and elongate his tenure for a third term. The effort was defeated in the Senate.